Some late model V6 applications require a gasket that is fitted on the thermostat. In this case do not install our supplied O-ring, reuse OEM gasket. Ideally the fan settings in your tune should be lowered to see the best possible heat dissipation from your cooling system. Otherwise a low temp thermostat will only be effective when the vehicle is moving because heat cannot be removed unless there is air passing through the radiator. However, there is not a handheld programmer available at this time capable of modifying fan settings in most of the new Ford engine management systems. The fan speed tables will need to be adjusted through a custom tune (available from most of our vendors) or via tuning software. These new systems estimate coolant temps based on readings from a dry head temp sensor. However these ‘inferred’ ECT values can be more volatile and vary from vehicle to vehicle. For example Mustangs typically read around 8-10° hotter whereas an F150 may read closer to actual coolant temps. This means that a vehicle using our 170° thermostat could see ECT anywhere between 165-205°, depending upon conditions and fan settings. We rely on your feedback, so please let us know if you become aware of any new developments in managing the fan settings for these applications. "I just switch out the 160 Even Flo for a 170 Reische and wow what a difference... ...I don't think the hot water test in a pot has any thing to do with how they work in the Mustang as my temps were significantly lower with the Reische 170 then the Even Flo 160. Even Flo I was seeing ECT temps of 199 all the time and CHT temps of 205-215 actually saw 218 once. Reische 170 so far the highest I saw was ECT temps of 180 mostly 178 during my drive, CHT temps were 185-187 max. Temp outside was 33 today but I have drove the car in snow with temps in the 30's with the 160 T Stat and still saw the temps as described above. The coolant temps were as reported my NGauge and the CHT was reported in the ford Gauges menu." Imitation is the most sincere form of flattery. Here is our original Ford-50 unit that is currently being copied by competitors. The primary drawback of this design is that customers commonly over-tighten the thermostat housing upon installation. This usually results in damage to the gasket, or in some cases, the thermostat wedging in one side and tilting out of position. If this occurs coolant may be able to go around the thermostat and, in cooler weather, this will result in a P0128 (low coolant temp) code and/or longer warm-up times. If you have thrown this code we first recommend replacing the gasket and reinstalling the thermostat, just lightly snug the housing bolts (around 40 in/lbs) but do not tighten the housing down completely. 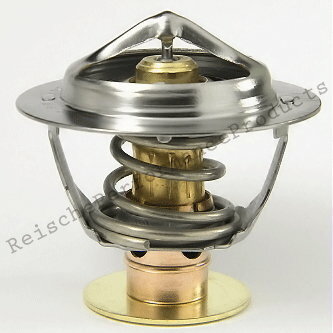 The gasket can be replaced with a Stant 27282, Gates 33619 or Duralast/Felpro 35710 but never reinstall an O-ring with this type of thermostat. Be sure the lip of the gasket faces up (right) and if reinstallation of the thermostat does not resolve this issue please Contact Us for a warranty replacement.